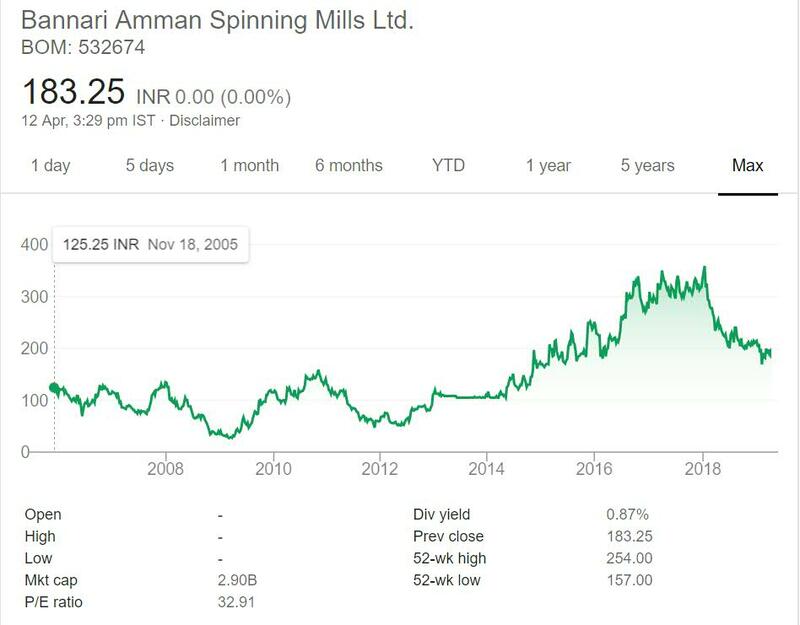 Bannari Amman Spinning Mills Ltd is in portfolio of Anuj Anantrai Sheth. He is one of the top investors in India. The company belongs to Textiles sector. As per the Company website it is a vertically integrated textile company engaged in the manufacture of cotton yarn, woven and knitted fabrics, finished garments, home textiles and wind power generation. The Company has also launched Blitz brand (Organic Cotton) of Under Garments for all age groups. Currently it has retail presence only in Tamilnadu state. It has separate website for it and products do lookk fashionable and promising. It also has joint venture with Brandot International US and Intimark SA of Mexico. The joint venture is named Young Brand Apparel. The Clients are Jockey, Next and Arvind etc. All the Wind Mills (total 4) and Factories (two) are located in Tamilnadu state. The stock got listed in year 2005 at listing price of 125. After listing cool off period stock witnessed 2008 global crisis and prices dived to 25 odd levels. Since then it has been on constant rise with some correction after decent period of bull run or positive run. The stock pays dividend consistently. Unlike most Textile stocks this one has performed well on stock exchanges and gave positive returns to investors. Bannari Amman Spinning Mills Ltd is a Textiles Company.I liked the approach of Company. It is venturing into business of making Underwear for all age groups and have dedicated stores and website for it. But there are issues as well. The Blitz brand of underwear it launched is its own venture. It has also launched similar products under Joint Venture with Young Apparel brand. So two same products from same company might compete against each other. Though I was more impressed with Blitz and presence of three offline retailers as well. The Company have to come out of Tamilnadu and start doing business into new regions. This is much needed for Sales growth and expansion. It will give boost to Stock price as well. I have not yet invested in a Textiles stock. I have mentioned the reasons in previous research articles of Textile Company. I may change my mind in future but as of now I am more inclined towards Textile machinery sector than Textiles.